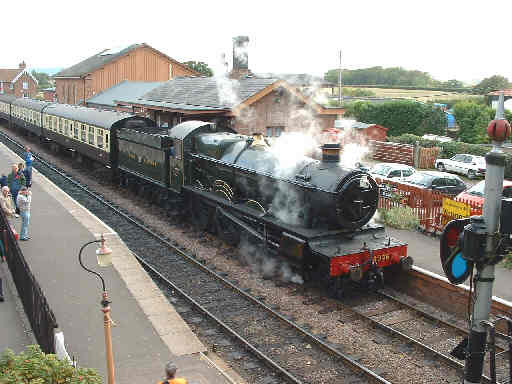 The WSRA's pannier tank 6412 was back from her travels for the Autumn Steam Gala, she is seen here working push-pull with a visiting auto-trailer - no. 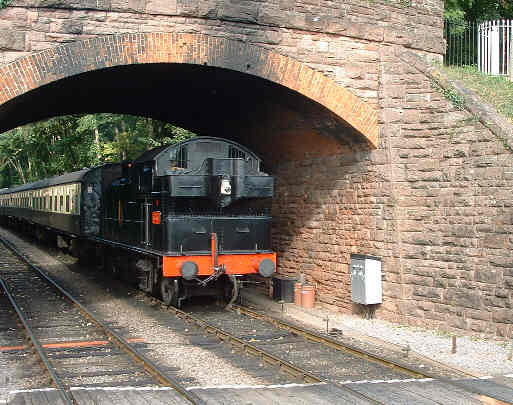 178 - at Bishops Lydeard. The other end of the auto train, a big attraction at the gala as working in this manner is very rarely carried out these days even on heritage lines like the WSR. 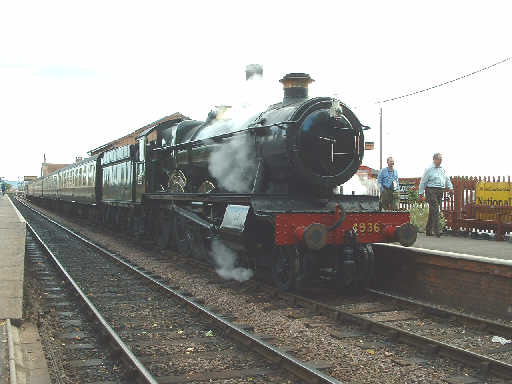 6412 propels away from Bishops Lydeard in fine style. 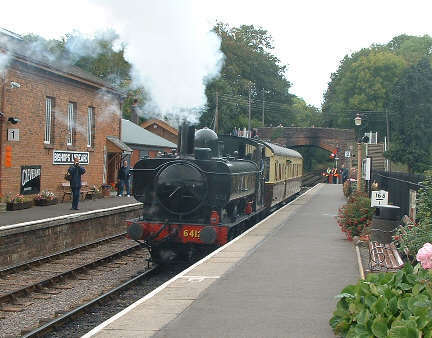 This working was to Williton but most were shuttles to and from Norton Fitzwarren - an excellent way to run trains over this little used section of line. Next arrival was visiting 0-6-2T 5637 from the East Somerset Railway, the previous weekend she had been working there in company with the West Somerset's 5542, this she was paying a return visit. After running round 5637 was ready to depart for Minehead. 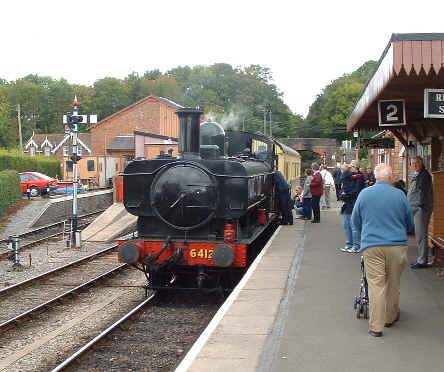 I could be wrong but I think this was the first time an 0-6-2T had worked on the West Somerset. 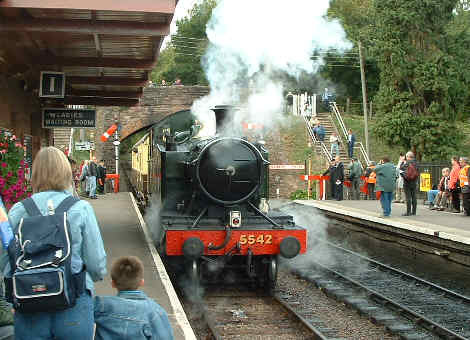 Off on the way back to Minehead, 5637 heading for the climb to Crowcombe. Small prairie 5542, back from her travels to the East Somerset, took over from 6412 on the auto trailer for the last couple of trips. 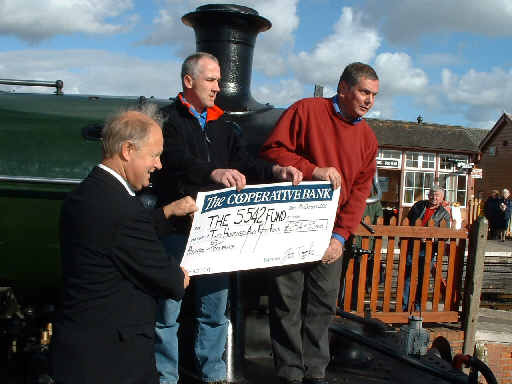 Prior to this Jon Tooke, a WSR guard, presented John Wood, chairman of 5542's owners, 5542 Ltd, with a cheque for the proceeds of a sale of railwayana he held on e-bay in aid of the loco after her broken piston problem earlier in the year. 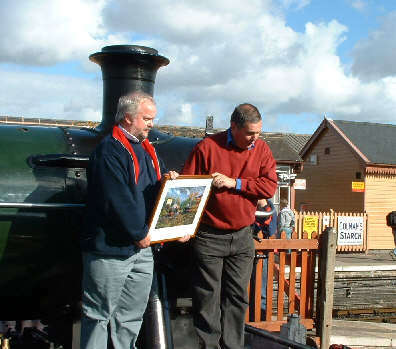 John Wood then presented a print of 5542 at Moorswater to Dave Mills, which he had won in a guess the mileage competition run by 5542's web site. 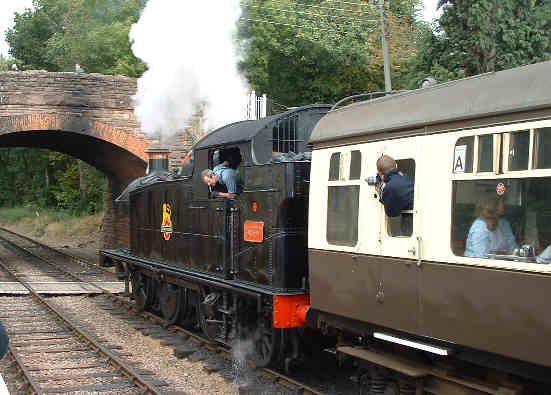 Dave and his wife Jayne run the Bristol Area Group of the West Somerset Railway Association. 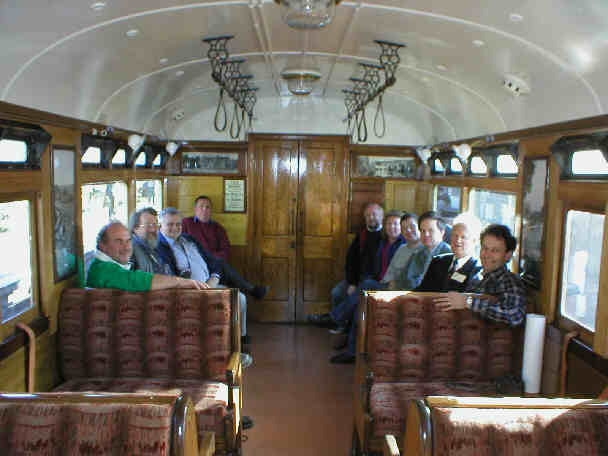 Dave, like Jon Tooke, John Wood and myself are members of the WestSomersetRailway e-mail list on Topica - we held a get together of as many who could make it on the auto train where we can be seen in this shot. 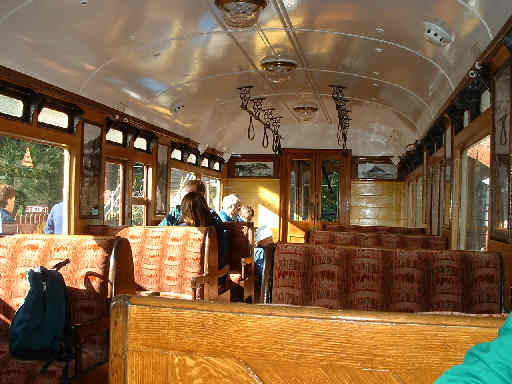 Looking the other way you can see more of the marvellously restored interior of 178. 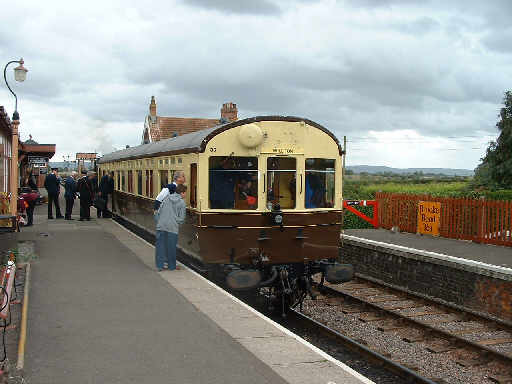 After our trip to Norton Fitzwarren and back 5542 and the auto trailer carried on to Minehead. 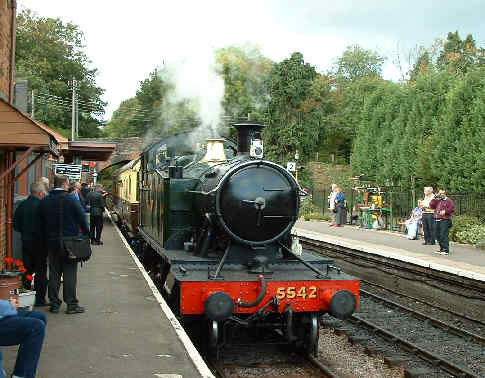 The next down train was in the hands of a large visitor, 4936 Kinlet Hall seen here arriving in platform 1 with the empty stock and wreathed in steam - quite useful to warm up in the cool of the late afternoon when standing by her! 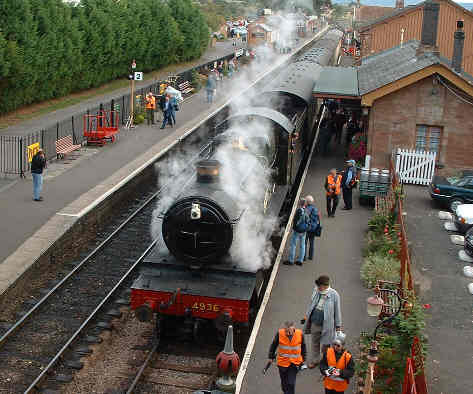 Two more views of Kinlet Hall awaiting departure from Bishops Lydeard with the last down train of the Gala Saturday. 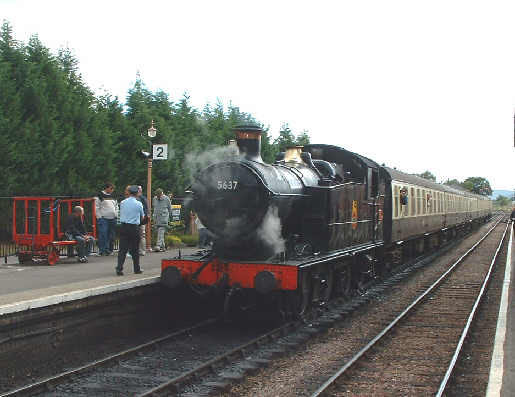 Pete Waterman's small prairie 5553 - sister to our own 5542 - seen arriving at Lydeard with an up train near the end of the day. 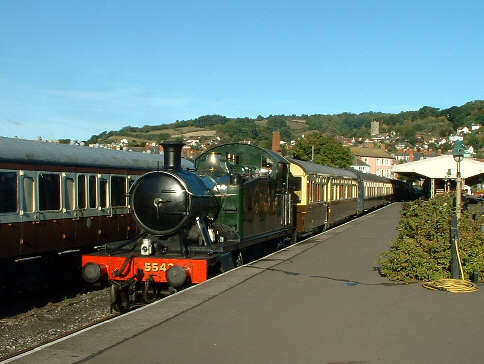 On the Sunday morning the first up train was the auto trailer hauled by 5542, seen here waiting to leave Minehead for Bishops Lydeard. 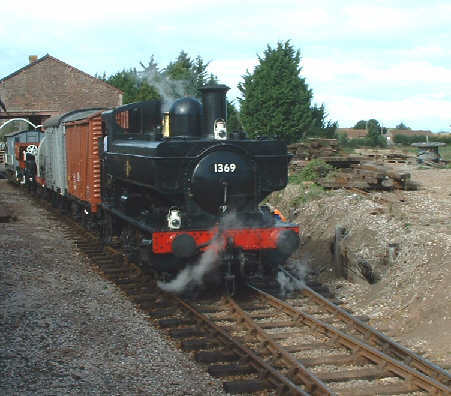 The next train was double headed by 80136 and 4936 Kinlet Hall, the pair made light work of the short train over the banks. 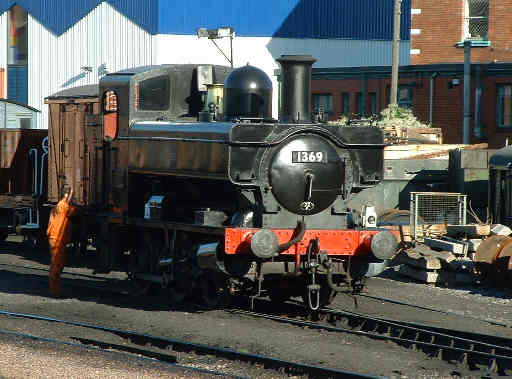 80136 in the shed yard before coming on to her train with the Hall. 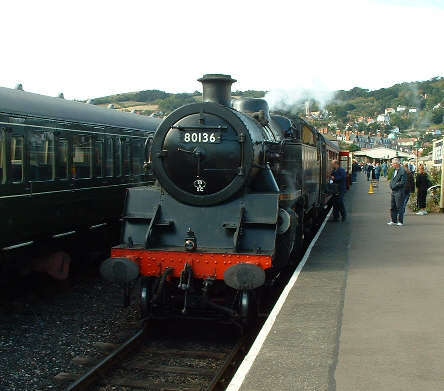 Another visitor was 1369, a 0-6-0PT visiting from the South Devon Railway. 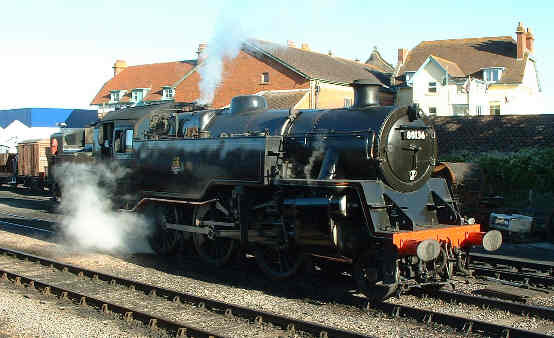 In May 1964 I saw her working light engine through Plymouth en route to preservation on the last day of steam west of Taunton, nice to see an "old friend" again. 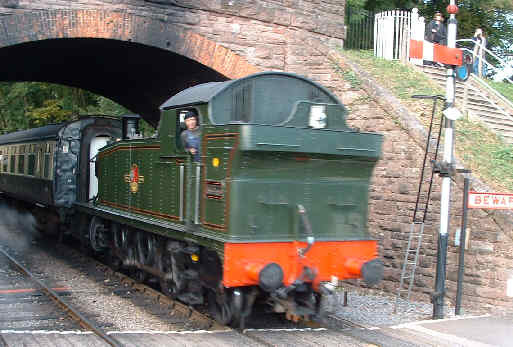 A little later in the day she was at Dunster on a goods train, an added attraction to see this side of railway working. 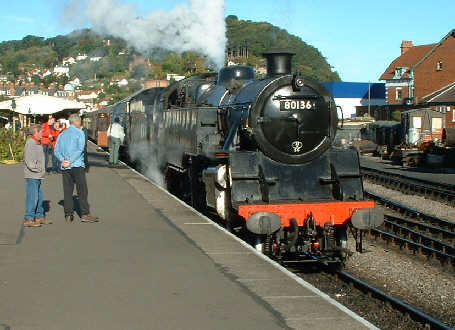 In the afternoon 80136 was in the bay platform at Minehead waiting to work to Bishops Lydeard.